What do you think of when you think about Canada? Does your mind conjure up images of pick-up trucks and Quebec? What do you think of when you hear the words “CBC Radio One?” A hard-hitting interview about the latest updates to the Canadian Food Guide? All this and more is ridiculed in Pat Kelly and Peter Oldring’s This Is That (a part of the Headliner Series at this year’s Toronto Sketch Comedy Festival), a staged version of the famed satirical CBC radio show that pokes fun at our particular brand of CBC-approved Canadian culture. Unlike everyone else in the audience, I did not come in already familiar with the show, but I quickly saw why This Is That can fill out a venue like Randolph Theatre. The show not only brazenly satirizes the hand that feeds them (This Is That is broadcasted by CBC Radio) but their version is so well-done that–according to Oldring–listeners sometimes have a difficult time telling the difference. My companion, whose family has a tradition of always turning on the radio in the mornings, confirmed that the show perfectly imitates the placid, smooth rhythms of CBC Radio One and is just as accurate in their earnest portrayal of the typical call-in guest. While it is easy to see how This Is That makes a great radio program, there is something special about watching it happen live. It just seems all the more impressive when you can actually see Kelly and Oldring switch from the smooth voices of their CBC Radio host personas into a variety of guest callers that ranged from gruff small town mayors relaying the reasoning for their recent amalgamation with an oddly sexual relish, to the shudder-inducing timbres of “the greatest Canadian author.” Oldring is especially fascinating to watch on stage, often embellishing upon his vocally-driven characters with more physical flourishes. In the world of This Is That, Canadians are painted as a well-meaning bunch who are fixated upon issues that are so ridiculous they even surpass the category of “first world problems.” There’s the story on the horrifying discovery that The Last Spike was not actually the last spike, and one about a campaign to baby-proof all the Parliament buildings. Often the interviews will result in the host pointing out the irrationality in the guest’s view, only to be dismissed with some high-handed stubbornness and the refusal to see sense. Nevertheless, underneath all the ridiculing and arguing, I still got the distinct sense that Kelly and Oldring has a genuine appreciation for the stereotypical Canadian desire to meddle and to aid one another. No matter how misguided, every guest is just trying to do the right thing. Kelly and Oldring’s depiction of the typical CBC radio show also highlights a sort of monotony in the content that is being created by our Broadcasting Corporation. The faux-Canadian patriotic photo montages/tourism ads that cap the various sections in the show include pictures that celebrate the diversity of our population, but the guests that actually “call in” sound awfully like they all come from only one segment of our society. As someone who grew up on CBC television, I was plenty amused by the production, but I wasn’t clutching my sides with laughter like my companion (and most of the audience). I think to really appreciate the comedy of This Is That, you do have be familiar with the medium they are mocking. While there were some general Canadiana jokes, the crux of much of the humour relies on a familiarity with, and a certain nostalgia for, the sound of our national radio. Indeed, even the demographics of the audience on my night reflected this, as most of them skewed older in age. With the ever-increasing diversification of our media consumption, I wonder how many members of my generation will be able to appreciate these jokes. But, then again, podcasts are still a thing. 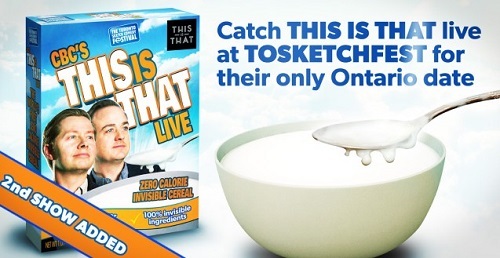 This Is That played for two shows on March 5, 2015, but The Toronto Sketch Comedy Festival is on until March 13 and is hosting a variety of events at venues across the city. The complete schedule of events is here. Ticket prices are $15 and are available online, Telephone sales are available at 647.505.1050. In person sales are available at the Advance Box Office, located at The Theatre Centre (1115 Queen Street West), from 12 to 5pm. Photo provided by the festival.